France is a very motorhome friendly place, or rather a camping car friendly place for us camping caristes. It is a great place to take your motorhome on its first overseas visit. Not only are there lots of campsites but there are also the aires de service also called aires de repos. 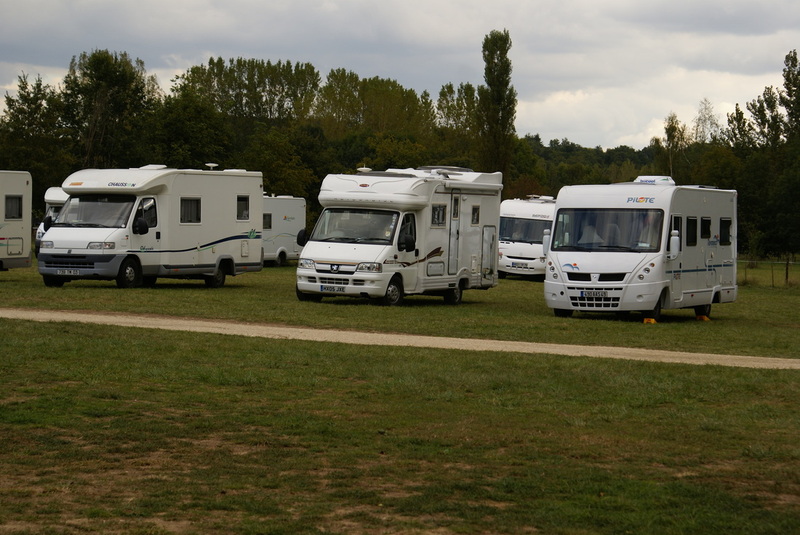 The campsites tend to close in mid September and don’t open again until mid April but the aires de service are open all year round.If you visit a French campsite you could be surprised by how few French vans there are, I think it's because they stay on aires. I am not talking here of the motorway services which quite often in France will have somewhere to empty grey water and fill up with fresh water but small spots in towns and little villages which have been laid out for motorhome parking. Some are merely a few slots in a larger car park but others are laid out for motorhome parking (motorhomes only, no caravans) with a place to dump and load up with water. Often there are electricity sockets so (usually for a price) you can get a few hours leccy and top up the batteries. We have visited pretty little towns with aires just a short walk from the centre, sometimes with individual pitches separated by hedges. Sometimes there is a small charge to park overnight, sometimes in the winter there is no charge at all. One year we felt very fortunate to find an aire in a small village that suited us nicely for an overnight stop on our way back to Calais. The village was very picturesque and we noticed a boulangerie across the road which would be perfect for picking up a baguette and some croissants in the morning. What made the aire even better was that there were half a dozen electricity points where we could hook up for no charge. We spent a peaceful evening in this lovely location, we even put the satellite dish on its tripod and tuned into some UK TV. In the morning I decided to have a quick shower before breakfast and a leisurely departure and it was once I had turned the shower off that I could hear noises outside in the car park. We looked out and discovered to our horror that it was market day and the market stalls were being constructed around us; the fish man was already laying out his selection of fish for sale. Breakfast was abandoned as we hurriedly stowed our stuff so that we could make a sharp exit before the market was fully established and open for business. I guess if we had not been early risers and appreciated what was going on around us we could well have been parked in the middle of a French market until early afternoon. Later it dawned on us that the electricity sockets were not there as a generous gesture to visiting camping cars but were also to provide power for the market traders. This experience has not put us off aires - they are a great way to see France and as they are either free or charge only a few euro they are an economical way to see the country. Not all aires have facilities, some are merely a stopping place to overnight and in the winter the water is sometimes turned off to avoid frozen pipes. Some aires are so established that the bread man visits each morning too. Scroll the page up to reach the list of pages on the right or click here to get back to the Welcome page.